(UPTOWN CHARLOTTE, NC) -- Preston Tucker , D.J. 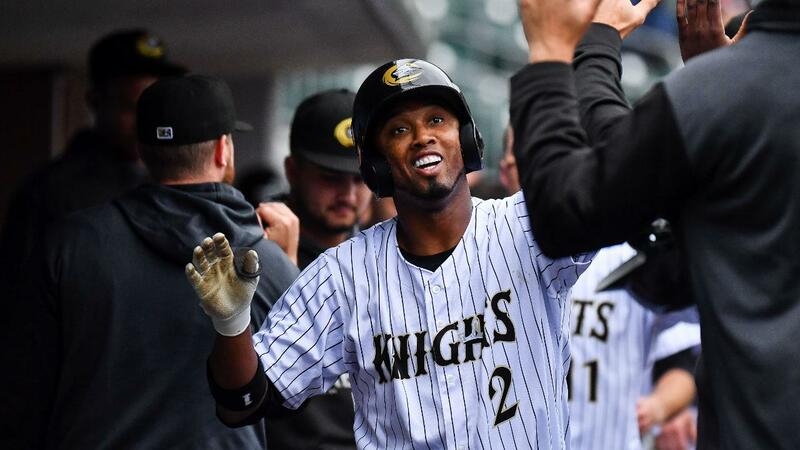 Peterson , and Alcides Escobar each homered to power the Charlotte Knights past the Durham Bulls by a score of 12-10 on Sunday in the finale of their four-game series from BB&T Ballpark in Uptown Charlotte. With the win -- their third in four days -- the Knights earned a series victory over the Bulls. Much like in their previous two wins, the Knights once again used the long ball to get past their in-state rivals on Sunday. For the third time in four days, the Charlotte offense pounded out three home runs and double-digit runs scored. Tucker launched a solo homer off Durham starter Aaron Slegers in the third inning. The home run extended his hit streak to 11 straight games dating back to July 4, 2018 with Gwinnett. He finished Sunday's contest 2-for-4 with two runs scored, a home run, and two RBIs. Designated hitter D.J. Peterson ripped a solo home run in the second inning of Sunday's game -- his second of the 2019 season -- while Escobar added his first Triple-A home run since August 6, 2009. Escobar, who was a Rawlings Gold Glove Award winner and an American League All-Star in 2015, went 1-for-3 with the home run and three RBIs. RHP Evan Marshall (2-0, 0.00) earned the win out of the bullpen after he allowed just one hit over 1.2 scoreless innings pitched. LHP Josh Osich tossed a scoreless eighth inning, while RHP Juan Minaya avoided some trouble in the top of the ninth to earn his second save of the season. Minaya walked two batters and allowed a run, but battled back to get former Knights infielder/outfielder Emilio Bonifacio to fly out to end the game. The Knights will open a three-game series against the Norfolk Tides (Triple-A affiliate of the Baltimore Orioles) on Monday night from BB&T Ballpark. Gates will open at 6:00 p.m. and the Knights will welcome dogs to the ballpark for the first "Bark in the Ballpark" game of the season presented by Williams Subaru. Pre-game radio coverage of Monday's 7:04 p.m. game is set for 6:50 p.m. on 730 The Game ESPN Charlotte. The "Voice of the Charlotte Knights" Matt Swierad and long-time Knights radio broadcaster Mike Pacheco will have the call for all of the action. KNIGHTS KNOTES: The Knights scored 36 runs over the four-game series. A total of 69 runs were scored during the entire series combined… RHP Spencer Adams started for the Knights and allowed four runs (three earned) on six hits over three innings of work… LHP Colton Turner did not allow a run over two innings in relief… Second baseman Ryan Goins , catcher Seby Zavala , and first baseman Matt Skole had two hits apiece in the win… RHP Dylan Cease , the number three prospect in the Chicago White Sox system as ranked by Baseball America, will get the start in Monday's opener for his Triple-A debut.